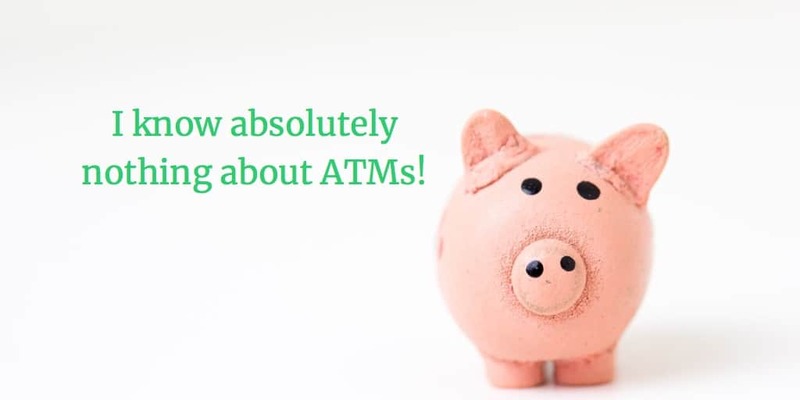 Kids think ATM is magical piggy bank. Use a no-cash allowance instead. Kids think an ATM is a magical piggy bank. Many kids believe this as early as Kindergarten. One bank survey showed that 40% of 5-year-olds believe you use a plastic card to get free money from a machine. Why is this? Kids believe what they see. For many their earliest experience with money is cash in their piggy bank. They know if they put money in the bank, there will be money in the bank. If they see a lot of cash in their piggy bank they think they have a lot of money. They don’t know how much money they have unless they physically count it. Do your kids see you put money in your bank? Most deposits are invisible to your kids. These electronic and automated deposits are money that can’t be seen or touched. This virtual money shows up as a number in your account. Do your kids see you go the bank and actually count the money in your account? You rely on online information and your records to know your balance. Do your kids know that the number shows the balance in your account? They see the machine spit out cash, but may not know that number represents the balance. 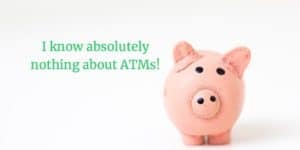 The difference between an ATM and a piggy bank is accountability. The bank dispensing your cash keeps up-to-date records of your balance, as you should be also. A piggy bank is not a calculator; it can’t add and subtract. There is no easy way to keep track without counting and recording the balance. Parents can help their kids learn how keep track of money as a number like you do. The No-Cash Allowance is designed to do just that using an allowance system in which a child controls all funds received from parents through a written account initially kept in the home. Adults act as bankers and the child as account owner. This is similar to an ATM system. 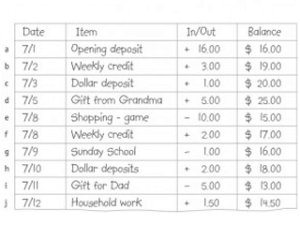 Kids keep track of their allowance in a written log by recording each transaction. Through repetition your child learns that money is a number that either makes the balance bigger or makes it smaller. 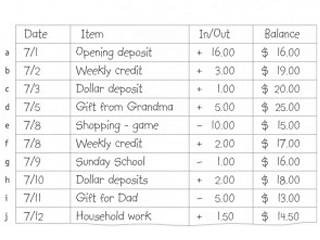 Kids write weekly allowance in account and update balances. Parents take the kids shopping and pays for their purchases using parent’s credit or debit card. Throughout this experience no cash has exchanged hands yet everyone knows exactly what happened. Deposits were made, account balances got bigger, purchases were made and account balances got smaller. Part of the learning experience for your kids is keeping track of their money. Seeing the balance go up and down is a great learning experience. If kids believe what they see shouldn’t they start learning that their money is simply a number? You don’t need a magical piggy bank to teach kids money is a number. A no-cash allowance can. Kids believe what they see. Let them see that money is a number starting now.